India Has No Border With China! During the heyday of English imperialism cartographers employed by the so-called British Raj, the occupying colonial power that dominated India were tasked with demarcating a border area between ‘British India’ and Tibet. A somewhat more difficult challenge usually faced by the imperial mapmakers, whose fondness for straight-line boundaries may still be seen in atlases today, particularly in Africa and the Middle East. The Himalayas were of a different order altogether, not only due to the immense physical difficulties and terrain but complicated by the ethnological extent of Tibetan culture, that was felt all over the Himalayan Region and into what we now recognize as Indian territory). The example of Dorje-Ling, later deliberately re-named as Darjeeling illustrating the point (where taxes were regularly levied by the Tibetan Government). 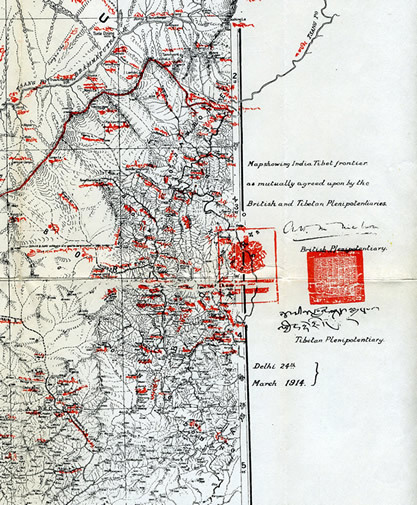 Sikkim, Arunachal Pradesh were (before English cartographers determined) very much Tibetan in terms of culture, influence, and to some degree administration. The crystal ball was obviously obscured by more immediate geo-political concerns at that time, which centered upon protecting British interests in India, no thought of Chinese invasion of Tibet, or a dominant communist ideology which later refused to accept the border on the basis it was conceived by an foreign imperialist power. These factors would bitterly contest the legitimacy of the McMahon Line, which to India became a symbol of national honor (conveniently forgetting that it only came into being through Tibet’s ability to enter into treaties as a de facto independent nation). 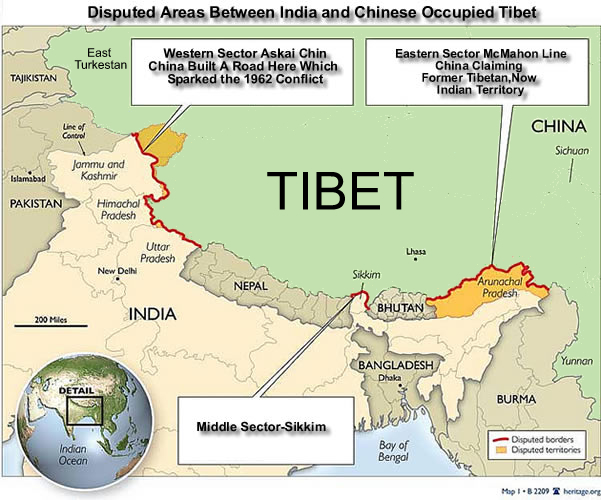 Relations between China and India were aggravated by the legacy of the border demarcation, effectively imposed upon Tibet by Britain, by virtue of its earlier military invasion of Tibet, and lead to the bloody the Sino-Indian of 1962. As India and China continue to exchange heated words on the border issue both sides may well recall that on August 25 1959 a clash between Indian and Chinese border forces took place at Tawang (formerly a Tibetan settlement incorporated into Indian territory by the McMahon’s cartographic determination). 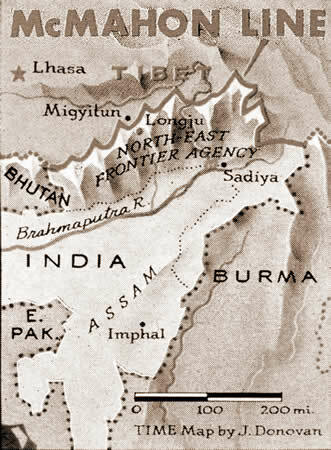 In reality this is more a dispute between regional super-powers over ideology, status and military strategy, than territorial exactitude or cartographic accuracy, even if the contrived demarcation imposed by McMahon were to be mutually agreed, an unlikely event, these factors would remain and continue to consolidate the anxieties and tension across the Himalaya.